Toyota’s new line of 8-series forklifts have gained plenty of attention for their impressive performance and exceptional value. 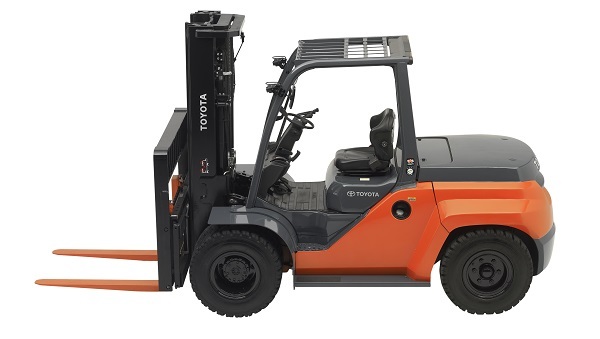 But these lifts are not just all about power – continuing with Toyota’s strong record of environmentally-friendly vehicles, the –series lifts feature outstanding fuel efficiency and less harmful emissions than other forklifts. The lifts range from 1,300 kg to 3,000 kg maximum lifting capacity (about 2,800 pounds to 6,600 pounds). Along with the advanced lift capacity, the Toyota lifts also have additional ergonomic and safety features included. The seats are described as “very comfy and well-positioned.” And with more floor space and bigger step, the forklifts allow greater freedom of movement and also prevent slips and falls when getting onto and exiting the control cabin. Versatile power options come standard. The Toyota 8-series forklifts are powered with internal combustion engines, but 3 modes are available: dual-fuel, diesel and LPG. For increased safety, the new forklifts have something called System of Active Stability, which reduces the possibility of roll overs. This feature works in with the Active Mast Controller Function. The AMC function matches any lift height and load weight in real-time, and this avoids tipping over or dropping a load. Just like Toyota automobiles, their forklifts are known for reliability and durability. Designed for use in a wide variety of industrial settings, the 8-series lifts should continue Toyota’s strong tradition of dependable transport vehicles. To get the best training on Toyota’s new forklifts or any other make & model, ForkliftCertification.com is the unquestioned leader in OSHA certified online training. With affordable prices, convenient flexibility and thorough content, we’re the choice safety training provider for companies like Coca-Cola, Harley-Davidson, Jenny Craig, Siemens, Snap-On Tools and many more. Thanks for reading the FLC blog. Check back for more updates on new forklift models, safety news and more. If you’re interested in our training, speak directly with the authority on OSHA forklift safety classes. We can be reached at (888) 278-8896, and the FLC contact page has more information.